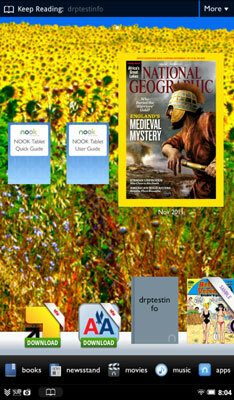 The NOOK Tablet can accept new programs that teach it new tricks: apps. An app (short for application) is a small software program. Where do you get apps? Well, in the case of the NOOK Tablet, BN.com is the only official available source. 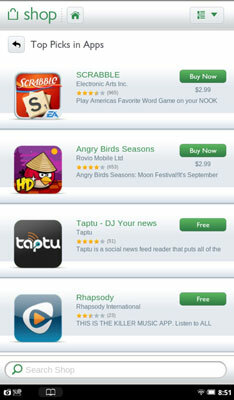 It remains to be seen how broad a range of apps the company will offer. At the launch of the NOOK Tablet, the app options were relatively insubstantial: no Skype, no online banking, no direct access to other reading material sources. There were some utilities that allow basic editing of Microsoft Office files, a few calendar and e-mail utilities, some cute games, and the a few airline and travel apps. In the Browse section, tap Apps. Look at categories (Education & Reference, Games, Entertainment, Productivity, Tools & Utilities, Social, or News and Weather) or tap in the Search bar at the bottom of the screen and try to find what you’re looking for. Tap the name of an app to find out more details. Tap the green Buy Now button. You get to tap the Free button if it doesn’t cost anything. The file downloads to your tablet. If there’s an interruption, the downloading starts back up when your WiFi is working properly. You can shop for apps from your desktop or laptop computer, or from another device that can connect over the Internet to the B&N store (like a NOOKcolor eReader). Any purchases (or free apps) are included in your account; the next time you use your NOOK Tablet, you’ll see the apps on the Daily Shelf with a Download badge. Tap the apps and they’ll get to your tablet. A number of hackers succeeded in rooting the NOOKcolor. Expect the same with the NOOK Tablet. When a device is rooted, users can install apps that come from other sources (like Android Marketplace or directly from a programmer) and make other changes. The downside: B&N could update its operating system or refuse to honor warranty claims for a device that’s been altered this way. (If you can use Erase & Deregister, that should remove all traces of rooting.) However, if you feel you need a more capable tablet, it makes more sense to buy a different device.